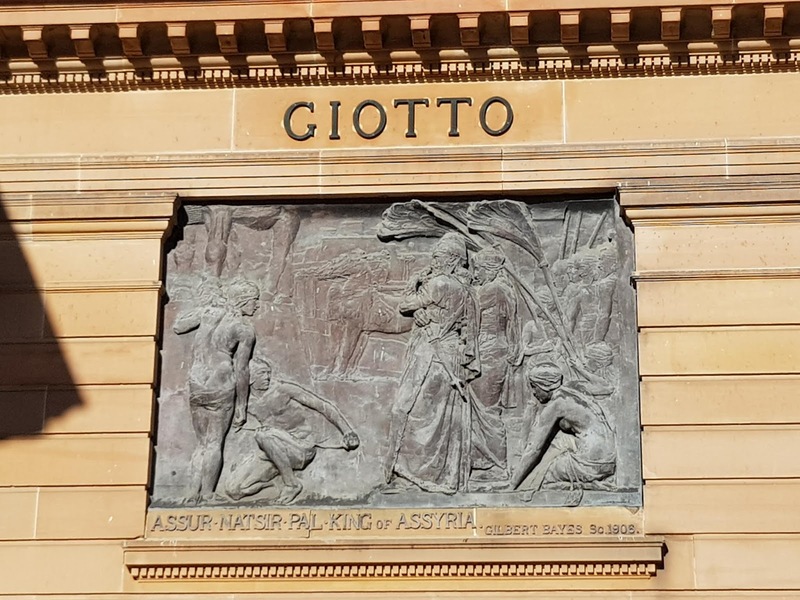 This is one of four relief panels which adorns the facade of the Art Gallery of New South Wales along Art Gallery Road at The Domain. The original wing and facade were built between 1896 and 1909. The Trustees decided to beautify it with a series of six bronze relief panels designed to depict the six "distinctive historical art periods" of the Assyrian, Egyptian, Grecian, Roman, Gothic and Renaissance but only the four older of the six intended panels were ever completed. The Assyian period is represented by "Assur Natsir Pal, King of Assyria" created by Gilbert Bayes PRBS in 1906. It depicts Ashurnasirpal II, from 883-859 B.C., with the Queen at the opening of a new building. After the death of Tiglath-Pileser III, Assyria had been reduced to comparative powerlessness, but under him the boundaries of the empire were extended, palaces, temples and other buildings were built, whose elaborate sculptures and rich paintings culminated the first period of Assyrian Art. The name "Giotto" is one of 32 artists lettered in bronze below the entablature. It amazing they could carve that in stone! Sandi, it's a bronze relief panel attached to the sandstone.